The Gender Pay Gap: How’d We Get Here? 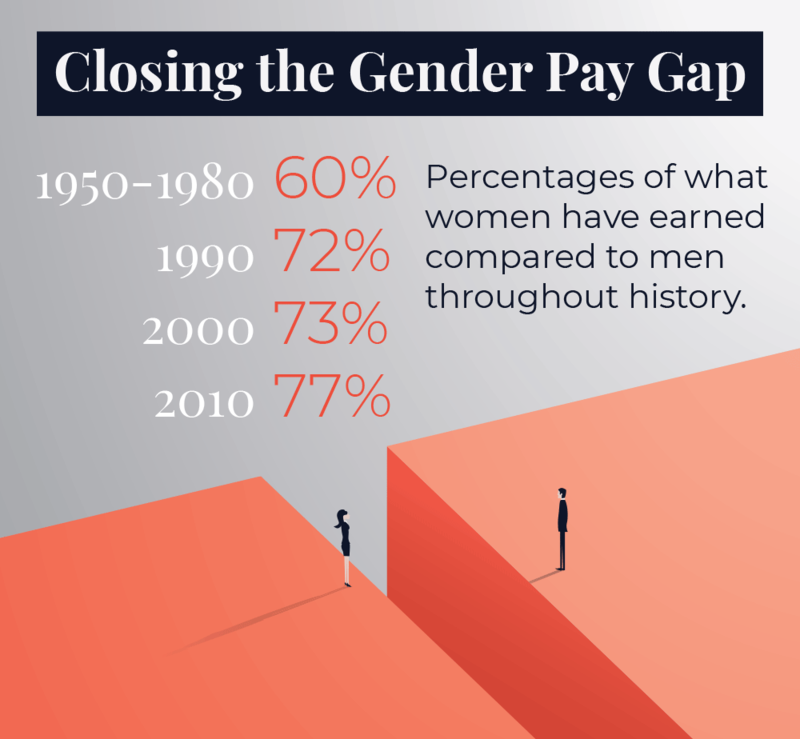 To close the gender equity gap in our lifetime, and unlock this unparalleled economic opportunity, we’ve got to learn from the past—and move forward. To address International Women’s Day, and in the middle of Women’s History Month, Google released research around search terms connected to the discussion of gender bias. The research is part of a larger marketing campaign launched by Google to highlight the economic and social achievements of women, and to call for global gender equality. Encouraging about the research, is the validation of gender equality as an issue of global importance. Also promising are the findings that in America, 40% of people interested in the topics surrounding gender equality are men (we spoke of the importance of bringing more men into the discussion here). The research overall shows the significance of this conversation and confirms people are searching for an answer to issues that historically, have not been publicly discussed. As we continue to engage in the conversation surrounding gender equity, gender equality, and workplace equity, and if we wish to unlock the unparalleled economic opportunity that will come from closing the gender equity gap once and for all—it’s important to look forward. Equally important however, is the need to peer into our past. Philosopher George Santayana’s famous words, “Those who cannot remember the past are condemned to repeat it”, are as true now as the day they were written. With this in mind, it’s beneficial, critical even— to dig into the history surrounding the pay deficit between men and women. How’d we get to where we find ourselves today? The gender pay gap is deeper than #PressForProgress and has roots extending far beyond the pay discrepancy between Mark Wahlberg and Michelle Williams, or the rise of Hollywood. The gender pay gap is rooted in a global history of disparity between women and men, pre-dating the 20th century. The tradition of unequal pay reaches as far back as Roman Egypt, where papyrus uncovered points to a gender-specific division of labor and much lower pay rates for women’s work. In America, for most of the 19th century, women and men received vastly different treatment. As the 1800’s progressed, slowly, state-by-state, married women received the right to own property in their own names, and late in the 19th century women were more widely granted the right to control their own earnings. By the time the 19th amendment was ratified (1920), giving women the right to vote in the United States, a system of inequity had already been established. Despite slow moving progress toward opening the rights of women in America, men, having had nearly all of the access to financial opportunities, held the majority of wealth and were able to found and operate businesses, leaving women either out of the workforce, or struggling to earn an acceptable living. International Women’s Day has its roots in this period of history–the day developed to recognize the activities of labor movements in North America and Europe at the turn of the 20th century. Unfortunately, following WWII, calls for equal pay lost momentum. Secretary of Labor, Lewis Schwellenbach made an attempt to continue the forward progress, by trying to pass an amendment applying to equal pay in the private sector. Schwellenbach’s bid was ultimately unsuccessful, due largely to the homecoming of veterans returning to jobs held prior to the war, and a return to long-held beliefs of women’s work consisting within the home. Despite the passing of these laws however, the World Economic Forum puts the time to global gender parity at 217 years. And as we’ve discussed before, closing the gender equity gap has the potential to unlock positive economic outcomes in the US to the tune of $2T, making this an issue of massive financial significance. It’s encouraging to know the world’s eyes are focused on issues surrounding gender equity, and increasing numbers of men are entering into the conversation. Many companies have pledged to support gender equity but are struggling to live their pledge and achieve gender equity–we can help. Pipeline is the key to unlocking this unprecedented economic opportunity.